Thanks very much for all of the wonderful comments on my latest freebies. I enjoy each and every one. I'm glad to know there are actually people out there who download and use my things (like Ljprince on scrapbook.com, you're awesome!) because it inspires me to keep on making more for you. Tomorrow I'm going to unveil "Freebie Friday" with of course yet another little freebie as part of the promotion, and then this weekend will also be full of freebie goodness with a Knit & Stitch Crochet Add-on Pack coming (by request thanks to your input on the Knit & Stitch freebie!) on Saturday, and a nice big Chicago Bears freebie kit coming Sunday to kick off the start of the football pre-season. I love football. GO BEARS! You can grab Crayons & Scribbles HERE. :) They're perfect for that upcoming back to school craze that's just over the horizon for many students. I know back in Indiana we started the new school year just before the middle of August, but here in Alberta, Canada schools don't go back until the first week of September. Either way, crayons seem fitting for this time of the year, so hope you like them and can find good use for them! 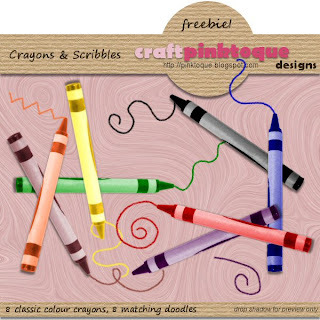 Thank You for sharing your freebie "Crayons and Scribbles" Great for our kids childhood school layouts!